I have just installed the PP2018/19. When Upgrading my payroll file to this latest version, I see a “Single Touch Payroll - Assign Allowances to ATO Guidelines” screen. What is this and what do I do here? Assign the correct type to all your allowances. New types are listed on the right-hand side of the window. You will now have to assign the correct type to all your allowances listed under Allowance name. The Payroll Premier upgrade process will attempt to assign your existing Allowances to the new Allowance Types according to the ATO guidelines. If you are happy with the listed types, you can simply click the “Accept Changes and continue” button and proceed with the upgrade. If any of the suggested types are incorrect or if you need to make a change, please select the correct type and change it. Select your existing allowance in the left box, as shown in the screenshot example TRAVEL. Select the correct type of the allowance from the Allowance Types box, in the right box - e.g. Travel. Click on the ‘Set TRAVEL to be Travel’ button. Note this button is dynamic and label changes according to the name of the allowance selected. Once selected, you will notice the type will now change to Travel, for the same allowance. Once done, click on Accept changes and continue. Your file will now be upgraded. 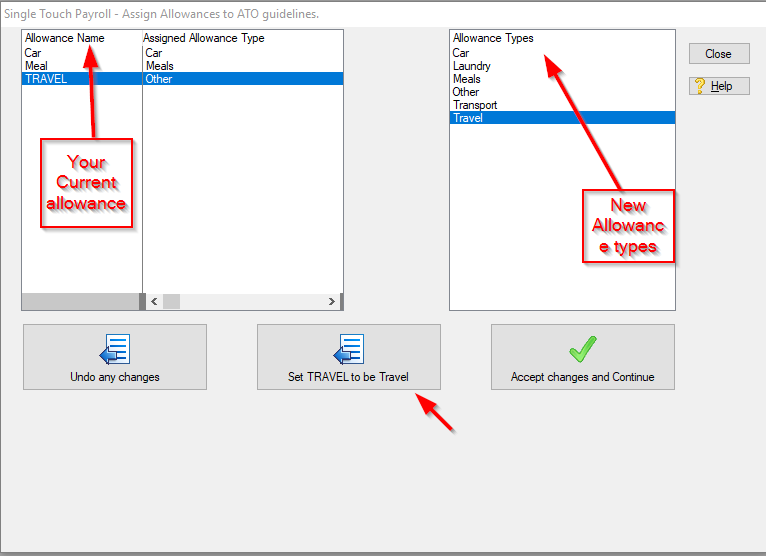 Please note: even if you do not make any changes here, you can always go back and change the allowances to the correct type anytime, from Lists -> Allowances menu.